harmony helped define the “common practice ” of the Baroque. This is an enjoyable program. There is imagination in texture, ornamentation, color, tempo, and expression. Right away in the Folia variations we are hearing variety and virtuosity from the performers. Such an imaginative approach to such a piece is so necessary, since the harmony is three chords! 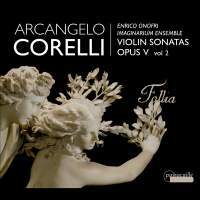 Enrico Onofri creates a beautiful and lyrical tone with his anonymous early 18th Century violin, so expressively played. Of note is the great variety of vibrato in different contexts: I’ve never heard a violinist use vibrato in such a convincing and varied manner. This is what the old treatises were talking about. The variety of expression that Onofri brings out of his instrument is a wonder. And the continuo band is rich, with violone (a large Roman cello), guitar, theorbo, and harpsichord. The liner notes, well written by the violinist, contain an interesting discussion on the ornamentation. I think it interesting that artists speak about their interpretive choices; I wish more liner notes would have this information, rather than dry historical essays that can be googled anyway. The first volume is Passacaille 988 (M/J 2014—John Barker discusses many recordings there).